Tirumala Tirupati Devasthanam has provided online booking for Arjitha Sevas in ttdsevaonline website. A TTD Registered User can book his wished tickets in online. 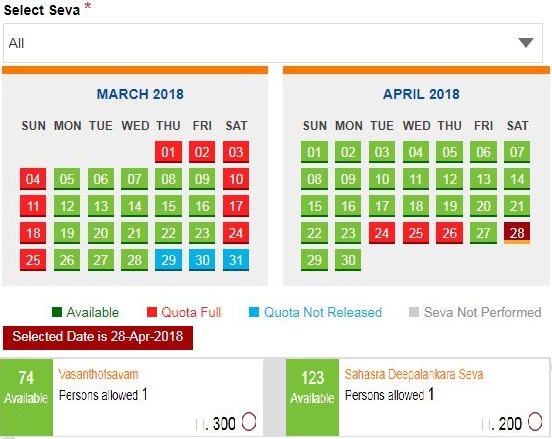 Previously TTD Board has released all seva tickets monthly wise. Due to huge response from devotees the board has decided to issue in two types. One type is through Electronic Dip system. Other is monthly release of tickets. In this post we will know about TTD Arjitha Seva Online Ticket booking in simple steps. How to check the TTD Arjitha Seva Availability? A TTD User Registered and verified with Mobile. If new TTD USER registration check the guide now. Check the availability of your required seva in the home page first. Due to huge bookings of online seva and darshan tickets, Advance booking for 4 months is running now. Visit home page and select Seva option. On there a list of available months is shown up. Available dates are highlighted in Green Color. Click on any one date to get the list of available tickets. In this way one can check the availability. Maximum 2 tickets can be booked for a user login. On every first Friday for every month ttdsevaonline website will be updated and slots for Electronic Dip Booking and Seva tickets is opened. Login to your account and select Seva booking option. Choose the date you want and click on it. A list of the tickets available on particular date is appeared below. For example you want Kalyanotsavam ticket Select Kalyanotsavam. But in this case only One ticket is allowed to book. As this is a couple ticket. Two members are allowed in single ticket. For other sevas two tickets are allowed. At this stage devotees need to enter the details and proceed to finalize the payments. Once the transaction is completed devotees will get the email, mobile alert for downloading the ticket. Tirumala Srivari darshanam was very fabulos with arjitha sevas onl.y. I have attended Suprabatha Darsanam, Nijapada Darsanam, Thomala, Archana by Lucky Dip. My family have participated in Kalyanotsavam, Arjitha Brahmotsavams more than 10 times. The good thing to know is prices are not changed from past 20 years. Hi, i am Harinath. I am searching for online ticket booking for ttd seva. Here i found useful information about all seva details and availability for getting seva tickets. Thanks for details mentioned. As a single individual I would like to do srivari seva ,how should i register my name? Hi, i am Sowjanya from Hyderabad. Few days back i got Suprabatha Darshanam Seva tickets from here. I suggest all who want to book online ttd seva tickets they can get details by searching here. Thank you for the detailed information. Hi, my self Krishna i am very much interested in TTD Tomala seva. So, i have searched for information regarding Tomala seva tickets online booking in this and i got very relevant details clearly explained about seva. Thank you very much for such a good information provided. Hi, This is Srija. I found ttd seva online availability information through this website by searching in google. I would like to thank for the updates information provided. Hi Its Mrudula from Vijayawada, Since so many days i am searching for Tirumala Kalyanotsavam tickets online booking. But i didn’t get any correct details about that. From here i get all details about online booking and i got tickets. I would like to thank and i suggest all go through this for ttd seva online booking. Hi, I am Yamuna from Anantapur. I really thanking you for the details about seva tickets you have provided in this. Recently i got my ticket for Suprabatha Darshanam Seva by booking through this website. The availability information is also very useful for those who want to take tickets online. I suggest who wants to get seva tickets online they may go through this information broucher..
Hi, this is Mamata from Kadapa, I searched for Tirumala Archana Seva ticket booking and from here i booked online tickets for ttd archana Seva. Thanks for online booking process information provided here. Hi sir. Is the Tirumala Bramhotsavams Dates & Schedule 2018 is finalized. Does two times will occur in this year. Hi its Arjun from Nellore. I am interested in TTD Seva. I need details regarding Tomala seva tickets online booking. Hi its Mahalakshmi from Chennai. I want to know the process of registration for Suprabatha Darshanam Seva tickets booking. Hi this is Krishna from Mangalore. I want to get details about Tirumala Kalyanotsavam tickets online booking. Hi this is Anil from Madhurai. may i know that when will TTD Nijapada darshanam tickets booking is going to be start?. Hi i am Keerthi. I got tickets from Tomala seva tickets online booking thank you so much for details provided here. Hi its Rahul. Finally i got tickets for TTD Seva from Suprabatha Darshanam Seva tickets booking thank you. Hi its Shashi. I want to know the dates of availability for Tirumala Kalyanotsavam tickets online booking. Hi its Prashanthi. I need information regarding TTD Nijapada darshanam tickets booking.